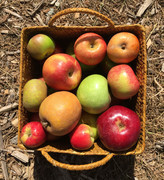 I have a small organic certified farm on the California Coast, and we grow over 175 kinds of fruit, including around 25 kinds of rare heirloom apples. I can only ship to the USA, alas. Please let me know if you have any questions. I love to talk about the fruits! 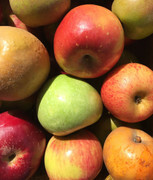 I purchased a sampler box of these apples, and have nothing but praise from A-Z. First, Nadine, is a joy to talk to and communicate with, and this is clearly a passion for her more so than a business. The fruit arrived when promised. It was immaculately packed with zero damage (something I probably have never experienced before in dozens of fruit orders). The apples are delicious and of excellent texture.Nothing like the horse manure you buy in the stores or even at most farmer's markets. I truly give the whole experience a 10/10. I have no affiliation with Nadine. Just happy to leave her the glowing review her project richly deserves. Don't take my word for it, order some for yourself.